Bandon Flood Scheme – Breach of Article 4 of WFD? The River Bandon rises in the Shehy Mountains in west Co Cork, and then flows through Dunmanway, Bandon, and Innishannon before entering the sea at Kinsale Harbour. During the record rainfall and subsequent flooding of November 2009 the river burst its banks, causing large-scale flood damage to Bandon town. The Office of Public Works (OPW) are now progressing a major drainage programme for this river at Bandon town. Details of this proposed flood scheme can be found here. An arterial drainage scheme was previously completed by the OPW in 2001 upstream of Bandon town, as part of the Dunmanway Flood Relief scheme. It is clear that this scheme and other drainage works in the catchment contributed to the flooding of Bandon town in 2009 – by transferring the flooding downstream. Dredging rivers always just transfers flooding problems further downstream. We should be looking at back-to-nature flood schemes for catchments like the River Bandon. Parts of the River Bandon, and its tributary the Caha River, are designated as the River Bandon Special Area of Conservation (SAC). These rivers flow in a southerly direction to the east of Dunmanway, Co. Cork. The Bandon SAC is selected for Floating River Vegetation , Alluvial Forests [91E0], Freshwater Pearl Mussel Margaritifera margaritifera , and Brook Lamprey Lampetra planeri . The Dunmanway flood scheme took place directly upstream of and also within the vicinity of the Freshwater Pearl Mussel populations in the catchment and was likely to have caused significant direct and indirect damage to Freshwater Pearl Mussel, lamprey and salmonid populations in this catchment. Lower reaches of the River Bandon – an SAC quality river channel. The lower reaches of the River Bandon provide a very important habitat for River Lamprey; ammocoetes and transformers. Different age groups of brook/river ammocoetes from the River Bandon. 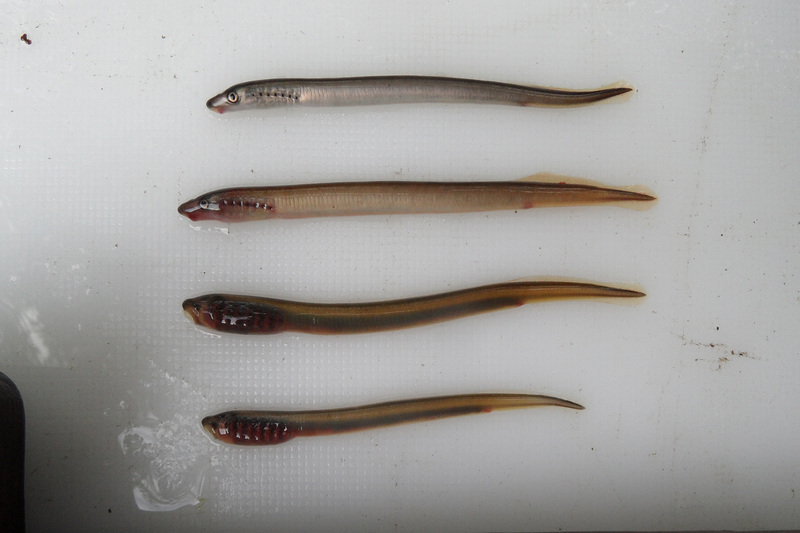 It is not possible to differentiate ammocoetes of these two species in the field, but it is clear that the lower River Bandon contains a significant population of River Lampreys. The River Bandon is renowned for its Atlantic salmon fishing. It is less well known for its populations of migratory River Lamprey Lampetra fluviatilis  . Indeed, the River Bandon is, in our opinion, one of the best rivers in Ireland for this species and should have been designated as an SAC for River Lamprey. This population is under significant threat from the proposed Bandon flood scheme which, along with the forthcoming River Clare Drainage Scheme, represents a return to the dark days of arterial drainage by the OPW in our opinion. 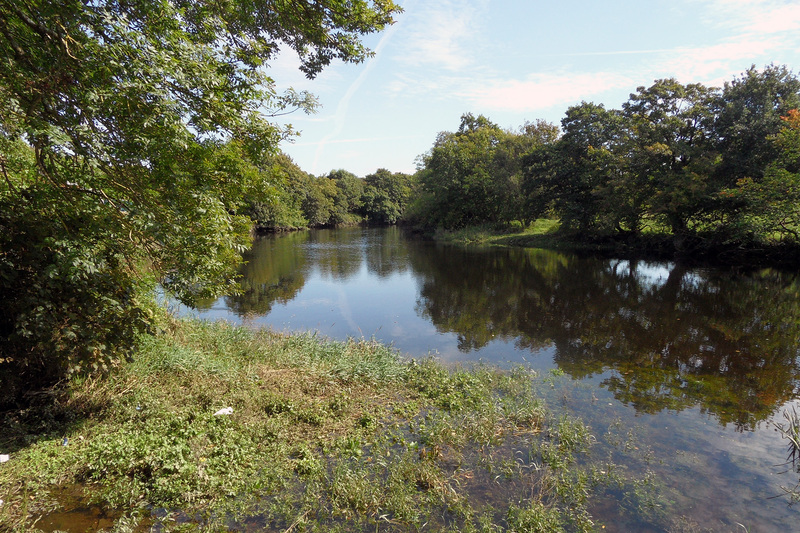 The River Bandon provides excellent habitat for migratory River Lampreys as they have access to over 5km of ideal spawning and nursery habitat on the lower reaches of this river, extending from the tidal reaches at Inishannon to Bandon weir (which is impassable for lampreys). There is also a long estuary which is ideal for adult foraging. On the River Fergus, for example, this species only has access to about 1km of suitable spawning and nursery habitat (now damaged to an integrity level by another OPW Flood Scheme). River lampreys are currently a separate species from brook lampreys, with different habitat and management requirements, and subject to quite different pressures and threats. We have argued that they may be the most vulnerable of the three Irish lamprey species and are currently only listed as being at favourable conservation status due to identification difficulties. The major flood scheme which is on the way for the Lower River Bandon follows on from political ‘let’s be seen to be doing something‘ dredging that took place here in recent years, which also caused significant ecological damage to the river, and used the most ridiculous and ineffective silt fence that perhaps has ever been used. These works took place when the aquatic ecology surveys to inform the Environmental Impact Statement (EIS) for the proposed scheme were ongoing. They are likely to have comprised the the aquatic ecology surveys used to inform the EIS, in particular the Freshwater Pearl Mussel surveys. High levels of siltation (along with straw bales) were found along 5km of river. Additional photos of these works and their impacts can be found here. These works would have provided no significant benefit in relation to flood conveyance. 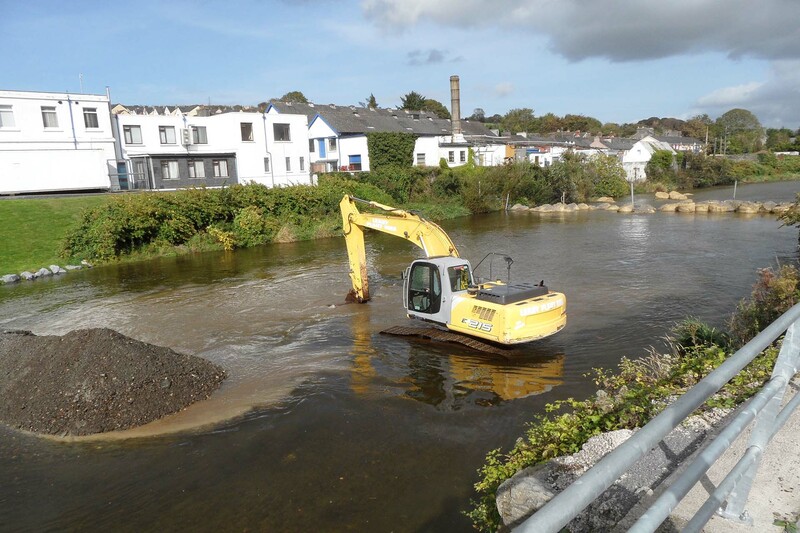 River Bandon Drainage Scheme advance dredging works. A new development in Ireland is the concept of having works like these in advance of a scheme, and in advance of EIA, AA and planning permission. The world’s worst silt barrier? High levels of suspended solids and siltation – along with straw bales – were found over the 5km of the River Bandon downstream of these works. 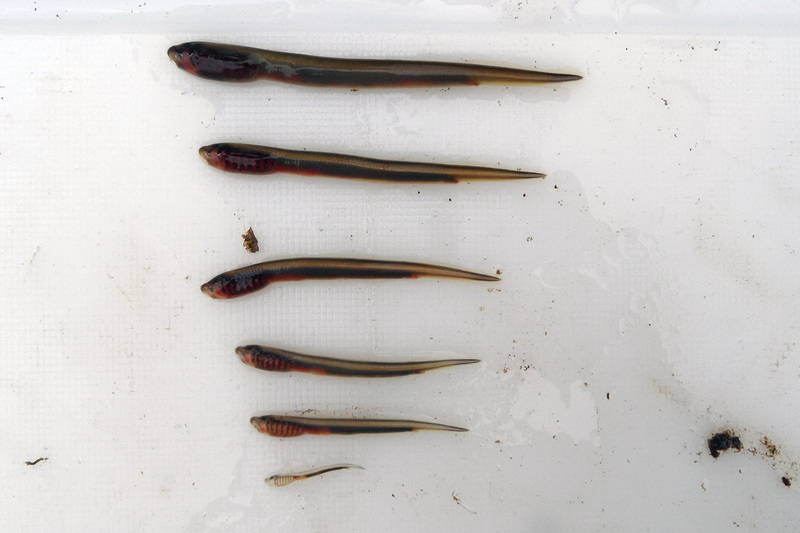 Although we undertook the fish stock survey which informed the Environmental Impact Statement (EIS) for the forthcoming River Bandon Drainage scheme – in which we identified the presence of significant lamprey (and salmonid) populations – we were specifically excluded from the impact assessment and preparation of mitigation measures, which at present we consider to be insufficient to protect River Lampreys. Consultations took place with fisheries interests, but no one was consulted in relation to the protection of lampreys. It is very unusual that aquatic ecologists engaged to do the surveys were specifically prevented from preparing the impact assessment and designing mitigation measures. Before and after photo-montages taken from the Environmental Impact Statement of the proposed Bandon Flood Relief Scheme are provided below. These were taken from the EIS which can be downloaded here. The changes proposed for the River Bandon will clearly change its hydromorphological status, and will therefore be be in breach of Article 4 of the Water Framework Directive. The dredging and modification work will also only be timed to avoid the salmoid spawning season, not the lamprey spawning season. There will be a permanent loss of juvenile lamprey habitats. OPW Standard Operating Procedure (SOP) for lampreys will be used, but these procedures are both insufficient and contain many impractical and possibly illegal measures (e.g. relying on visual observations by foremen to avoid actively spawning lampreys). It is also clear that measures such as collecting and returning juvenile lampreys are not actually practised. No reports or information has ever been published by the OPW showing that this measure is actually implemented, and indeed the lamprey SOP itself acknowledges that severe effects are likely and does not actually commit to any measures. We have interviewed machine operators and supervisors working on rivers and they could not produce any records of lampreys (or crayfish) being returned to rivers. It is also noted that the SOP is for drainage maintenance, rather than for an actual flood scheme. The above proposed works will clearly be changing the hydromorphological status of this watercourse, and result in significant aquatic ecological impacts. In the before photo this stretch of river contains floating river vegetation habitat that appears to approximate to the Annex I habitat ‘Water courses of plain to montane levels with the Ranunculion fluitantis and Callitricho-Batrachion vegetation ’. What is proposed here is loss of riffle habitat, channelisation and bank armouring and a profound impact on the aquatic and riparian ecology of this stretch of the River Bandon. There will be total loss of the lateral hyporheic zone and associated juvenile lamprey habitat. There is also change from riffle habitat which can be used as salmonid nursery habitat, to a channelised river channel. The channelisation and bank armouring proposed here will again have a profound impact on the aquatic and riparian ecology of this stretch of the River Bandon. There will again be total loss of juvenile lamprey habitats. There is also trimmed Japanese Knotweed in the after photo-montage. Total loss of riparian/hyporheic zone via dredging/canalisation and armouring. Total loss of lamprey nursery habitats along edge of river. The entrance to this fish pass is located too far downstream from the weir to be of any use. River lampreys cannot pass this weir at present, and probably will not be able to use this pass design. 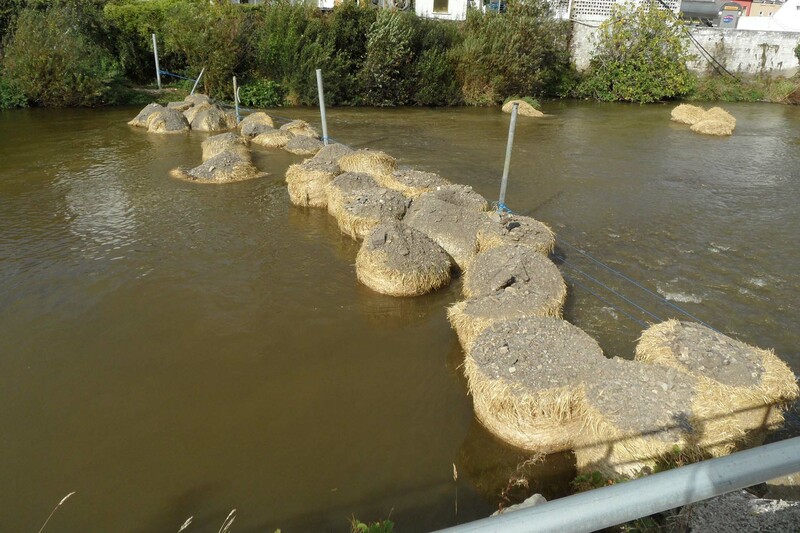 New fish pass at Ennis – enough to compensate for integrity level damage to SAC? If Inland Fisheries Ireland are an angling development agency – which is all they seem to be – then who is protecting river channels that are located outside SAC’s in Ireland? Nobody it would seem. But even SAC rivers in Ireland are not protected as evidenced by what happened during the River Fergus (Ennis) Drainage scheme, and the forthcoming River Clare (Claregalway) Drainage Scheme which will be examined in the next post on this site. For the Bandon scheme there was at least a proper fisheries and aquatic ecology completed – even if the ecologists that prepared this were excluded from the impact assessment. For the River Clare scheme all the OPW commissioned was a two-site kick sampling survey, and a look around, to inform the EIS and Appropriate Assessment of a €7 million+ flood scheme on a Natura 2000 river. It seems like we are going backwards in Ireland in relation to protecting our rivers and these schemes are heralding a return to the dark days of arterial drainage. They are actually putting in the sort of channelisation that we are spending millions adding meanders and gravel to here in England. Crazy. Great piece btw keep fighting the good fight. It is important to realise that the river Bandon was a fantastic Atlantic salmon and Sea Trout river. This should never have been allowed to turn into a case of flood versus fish. That was just the view of the uninformed. If you kill off the native species of a river, this directly impacts on your broader ecosystem (insects, birds, plants etc…) and you take from your own natural heritage. It is a pity to see such a beautiful river and part of Ireland turned into yet another ugly storm drain. The river Bandon is in big trouble and hopefully the people of Bandon will demand better before it is too late.